I found the guitar methods book for me: H.O.T. First Year Guitar (Nancy Lee Marsters) What makes it so great? It's written by a former choir director who explains many things that a guitarist would take for granted but which a new player would treat as "secret techniques". For instance, Nancy teaches you how to move your fingers from one chord to another in a progression (sliding, lifting, moving, etc.). It may sound like a small concept, but unless the student (or the teacher) learns the smoothest transitions from chord to chord they will not be able to move quickly from one chord to the next. The red teachers manual has lesson plans, quizzes, and proficiency tests. Our class learned the "A" Progession transitions (p. 12) and practiced that progression playing The Camptown Races (p. 100). Students would tell her when they were ready to "test out" and go 1-on-1 to a corner of the room during break and play the 2-octave natural note scale in 1st position while calling out the fret numbers. Special prizes were given to the students who also could call out the note letter names as well. This is the first assignment she gives her beginning guitar students in the first week of school. They must also test out by Friday of the 1st week. The prizes for our Level 1 class? A star post-it on the head of our guitars if we could call out the fret numbers while playing the scale and a sticker on our name tags if we could name the letter names as well. These scale patterns are shown on p. 22 of H.O.T. First Year Guitar in chord charts and on p. 31 in notation. Rob illustrated LH hand positions for playing scales (parallel) and for playing chords (rotated) using page 10 of the Mel Bay Modern Classical Guitar Method (Stanley Yates, Mey Bay MB21548BCD). He reminded the class that nothing should touch the neck of the guitar except the thumb on the back of the neck and the fingertips on the fretboard. Rob told us that H.O.T First Year Guitar is a method book which is intended to be taught sequentially from the beginning to the end of the book and is appropriate for 2nd year middle school guitar student or a high school guitar student. We then practiced pp. 32-35 which have melodies using groups of two adjecent strings (6-5, 4-3, 2-1) which are then combined in a trio. Essential Elements continued to be the most used book of the workshop. Shelley started by showing the class a quiet tuning method for a large group. She tuned her guitar first (she and Rob both play on nylon string acoustics) and then instructed us to place our guitars on our left legs with the neck straight up in the air. Since sound travels faster through a solid than through air, she told us to place our left ear on the shoulder of the body and listen as she played a string on her guitar. We could tune very softly using this method because we didn't have to play loudly to hear our own instruments. The only problem was making sure we were adjusting the correct string peg because the neck was vertical and not in the same orientation as normal when tuning. We then practiced alternating "i" and "m" fingers playing two eighth notes on each string, ascending and descending strings. Since the Middle finger is longer than the index finger, it is normally used to "ascend" from strings 6 to 1. The reverse is true when "descending" from 1 to 6: "i" goes first. The Prelude (p. 72) was used to illustrate Pima fingerstyle playing. It is a beautiful little duet which gives the student a real feeling that they are playing beautiful classical guitar music. H.O.T. First Year Guitar, Unit 6 (pp. 61-64) further illustrated fingerstyle playing. The exercises on p. 63 help the student practice using a rest stroke for their thumb (P) while playing free strokes with ima fingers. Shelly demonstrated that the ima fingers should touch the meat of the palm every time and not just dangle in the air. If one finger play, the others should come along with it to touch the palm. The rest in these exersizes helps the student prepare their ima fingers back on the 1st-3rd strings and their thumb (P) back on one of the bass strings. Page 64 give further arpeggio and chord changing practice. Throughout the workshop, students have been encouraged to write their questions on sticky notes and place them on a tag board on the wall for Shelley or Rob to answer later in the day. Questions this afternoon were about the structure of a typical lesson. Rob seats his class guitar student in rows of six, with three chairs on each side of a center aisle, about four rows deep. Shelley runs three columns of two chairs each. Both seatings allow for easy division of the class into duets (part 1 one side of the aisle, part 2 on the other), trios (Shelley's is by column, Rob has to divide the chairs on the aisle into the 2nd part with the outside two chairs becoming the other parts) and quartets (by row from front to back). Both Rob and Shelley number each seat, stand, and classroom guitar so that they can handle papers and classroom management issues. Shelley goes further by naming each guitar with a famous player's name (Jerry Snyder's Guitar School 1 Teacher's Manuel, p. 7 - Listening Activites for names and styles). This allows the guitar to become a "person"al item for the student and have built in listening activites and writing lessons based on that guiartist's name. Shelley groups styles in her three column setup by duet partner (e.g. pop, classical, country across one row). Rob shared the mantra "Ask and ye may recieve. Don't ask and you won't get it" and "If you steal from one person it's called research. If you steal from many it's called research." 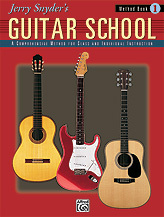 Today, June 28, 2010, was the first day of Level 1 Teaching Guitar Workshop at Olympia Resort in Oconomowoc, WI. I wanted to take this course last summer, but I didn't get my registration in early enough and all the workshops around the country filled up before I knew it. This year I got my registration in early enough and was thrilled I was accepted! I wanted to take this class because three semesters ago I started teaching my Music Technology students how to play guitar to help them be able to listen for chord changes in the loop-based song creation they were composing. So I bought a guitar, taught myself three chords (G, C, & D) and determined to teach my students the same. Well, three semesters later, we have added many other chords, a number of songs, and are attracting a lot of students who want to take Music Tech just to learn how to play guitar! Rob Goldsmith, one of the two instructors, told us the mantra of this workshop: "We learn in four days what it takes a year to teach our students." With that in mind, I wanted to remember what I was taught by blogging about it, also so that others might learn about the Teaching Guitar Workshops and possibly take the plunge to teach guitar to their students. As Rob also said today, "Guitar is the new recorder!" The day was divided up into six sessions with a basic concept taught or illustrated in each session. I was juggling a guitar, about 20 methods books, a pencil, and a folding music stand. I found out that "rest position" (putting the guitar strings down on your lap) provides a good writing desk in a pinch! The first book we worked in was Essential Elements for Guitar, Book 1 (Will Schmidt & Bob Morris, Hal Leonard). The first session dealt with the basics of rest position, playing position vs. classical position, right hand strumming position ("hitchhiker hand"), parts of a guitar (acoustic and electric), left hand finger numbers, how to read a chord chart, playing "in the fret box" vs. playing "on a fret", and playing easy C and G7 chords. And that is just pages two through five in Essential Elements for Guitar, Book 1! Can you tell my two guitar instructors either grew up in or taught in the Las Vegas school district for the majority of their teaching career? They are Rob Goldschmidt and Shelley Brobst. Since this workshop is designed to enable music teachers to become better guitar instructors for their music classes, the focus is always on teaching techniques. One of the most common techniques used today was echo playing: the teacher played a short example which was immediately echoed by the class. This method works for a new chords, new notes, and simple "improvisation" motifs using limited number of notes. Teach your students how to read a chord chart so they are not dependent on you to translate the symbols for them. Place your fingers on the fretboard in the order of numbers on the chord chart. Ideally this will happene all at once, but for very beginning students place one finger at a time, playing that string, checking for a full, ringing tone before moving on to the next finger. After all fingers have been placed, strum each string of that chord one at a time, making sure all strings vibrate freely and are not muted by misplaced or flattened fingers. Echo play each of the strings one-at-a-time for you students so the students know how each string should sound before they play their chord. This teaches the students to listen critically. If any strings are muted, the student should "become their own teacher" and try to figure out why their string or chord doesn't sound right and try to fix their own problem before asking a neighbor or the teacher for help. If a string buzzes, move that string's finger towards the body of the guitar, right up to the next fret, but not on top of it. This is not always possible with all chords when they have more than two strings fretted. Once the student is comfortable playing the chord, add a drum machine pattern to play the chord with. It's much more fun that just playing to a metronome! The student should also get used to tapping their foot along with the beat. Notes taught today: G (3rd string, open), A (3rd string, 2nd finger, 2nd fret–a.k.a. "2-2"), B (2nd string, open), C (2nd string 1-1), D (2nd string 3-3), E (1st string open), F (1st string 1-1), and G (1st string 3-3). Rob developed the "verbal shorthand" of naming the finger and fret (e.g. "2-2" for 2nd finger, 2nd fret) so that it wasn't such a mouthful to tell his middle school students where to put their fingers when playing a note or a chord since three things must be said: which string, which finger, and which fret. I'm going to try to use his verbal shorthand with my own students because I've stumbled over my own words when trying to describe the same thing for my Music Technology students. Above all, go slowly, playing on one string with a limited number of notes in various rhythmic patterns in order to "put in the reps" and burn that note position into the player's memory. For new guitar students it is very important to build in a lot of repetition so that their muscle memory takes over (in the future) for their thinking speed (which is very slow at the beginning). The amount of "time on instrument" also will make huge difference in the amount of material that can be covered in a semester's guitar course. If the guitar class meets every day, much more material can be taught than if the class only meets once or twice a week. Likewise for the student, if they are practicing at home as well as learning during guitar class, they will progress faster than if they only have access to a guitar during class time. Everyone plays part 1 with CD accompaniment. Everyone plays part 2 with CD accompaniment. Count off every other person 1-2-1-2, etc. 1's play part 1, 2's play part 2 with CD. If a CD accompaniment is unavailable either the teacher or more advanced students (or both) can play the accompaniment from the chords provided. In this way, the piece can be practiced slowly and gradually sped up over the course of many days until it can finally be performed with CD accompaniment. Essential Elements for Guitar, Book 1 (Will Schmidt & Bob Morris, Hal Leonard). This book interperses the teaching of chords and notes and includes 141 songs which illustrate and reinforce every concept which is taught. Comes with professional accompaniment CD. The 21st Century Guitar Method Guitar Ensemble 1, Student Book (Sandy Feldstein and Aaron Stang, Alfred EL03955S). This book correlates with a methods book and helps teachers fulfill the National Music Standard of ensemble playing. Each song in this book has three-part guitar with optional piano, bass, and percussion parts. Each ensemble part is on a different page, not all scored together on separate vertical staves in a full score. Mastering the Guitar: Class Method Level 1/Beginning Elementary through 8th Grade (William Bay & Mike Christiansen, Mel Bay MB97121). This method book, besides being a complete guitar method for all eight grades, contains some songs which correlate to novels which middle school students may be also reading: Where the Red Fern Grows, A Wrinkle in Time, Charlotte's Web, The Old Man and the Sea, and Bridge to Terebithia. Some of the early lessons have similarity to other string methods (Suzuki violin and fiddling) with lots of note practice and phrases which help students play rhythms (e.g. "Hiking Up the Mountain" for eighth, eighth, eighth, eighth, quarter, quarter). 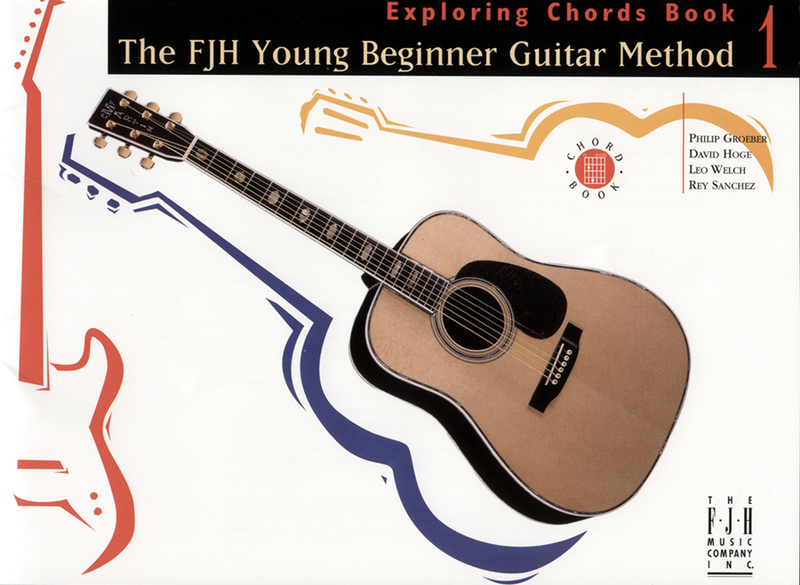 First Lessons – Beginning Guitar: Learning Chords/Playing Songs (William Bay, Mel Bay MB20000SET) comes with Accompaniment CD & Lesson DVD. Teaches only chords and strumming patterns. Transitions between chords is a natural lesson for every new chord and song selection. Every song's starting note is given in a chord chart to advocate singing while playing guitar. Includes information on how to restring a guitar. Hush, Little Baby (p. 15) how to mix beginning & advanced players on the same song: beginning students strum "simple G", advanced strum alternate voicing of G or D7 or modifying strumming pattern to allow beginning players to drop a strum on beat 4 (or 3, or 2) to allow for more time to shift to the next chord and yet always "hit the new chord on 1"; practicing going back and forth between G & D7 using a guide finger. Amazing Grace (p. 17) – five chords! G, G7, C, Em D7 Good chord review/culmination piece. Don't know/remember a chord? "Look it up!" Jerry Snyder's Guitar School: Method Book 1 with CD (Jerry Snyder, Alfred 17879) Interestingly enough, even though this book has a page on tapping your foot while playing, it is very extensive and advanced. For advanced middle school of high school level players. Section 1 is all about Chords and Accompaniment. Section 2 seems to go backwards to note reading and learning to read music. 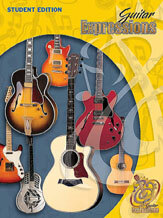 Guitar Expressions: Student Edition (Aaron Stang et al., Alfred EMCG1002) A high gloss, full color, spiral bound methods book which incorporates theory, vocabulary, cross-curriculuar opportunities, and assessment forms. Echoing the teacher "makes the vocabulary" of improvisation because the bar motifs that the teacher improvises for the student become "words" which can be strung together (without an echo) to make an improvised solo. Using a restricted set of notes, always starting on E 1-0 gives enough parameters to be predictable enough not to be totally overwhelming. A variation on this could be an advanced student playing the part of the teacher while the class echoes them, or pairing up student with one being the teacher and the other being the echoer. This would be more successful after echoing the teacher many times. Tuning (Essential Elements, p. 92): Just like my first Suzuki violin teacher did for our group violin lessons, the guitar teacher is encouraged to tune the student's guitars for them at least for the first 9 weeks of instruction so the student develops their ear of what an in-tune guitar sounds like (and thereby what each string sounds like in relation to each other string when in tune) before every trying to tune a guitar on their own. Once starting to tune that guitar by themselves, students are encouraged to first learn open-string tuning, using a reference CD or electronic tuner. Direction Terms (Essential Elements p. 92): What seems natural to the music teacher is not necessarily natural for the beginning guitar student, especially when numbering strings or frets or discussing higher or lower pitches in relation to higher or lower strings. Since the strings are numbered 1-6 from the string farthest away from the player (little #, little string) to the string closest to the player (big #, big string), and with the highest string being counterintuitively "on the bottom" of the fret board and the lowest sounding string being "on the top", it becomes beneficial to talk to the student in terms of directions such as "towards the floor" and "towards the ceiling" or "towards the body" or "towards the head" instead of referring to "higher" or "lower". For the first half of the day I felt pretty good. My background and self-taught methods seemed to be validated, but by the afternoon, it became apparent to me that I was lacking in both note reading and the muscle memory necessary to cleanly land notes of the G Mixolydian scale (GABCDEFG). It felt like I was back in my first year of group adult Suzuki violin lessons all over again. But that's okay. In one day we accomplished everything that I currently teach my Music Tech students in their guitar unit. I can't imagine what is next!